Biorb Life 60 Review - Good Tank or Not So Good Tank? Find Out Here! Made of acrylic, which is stronger than glass. Underground filtration system means less clutter in the tank. Very easy to set up. Air pump is a bit noisy (suggest buying a different one to go with it). Underground filtration = a bit more time for cleaning. Heater must be purchased separately. The BiOrb Life Aquarium series comes in 3 different sizes: 8-gallon, 12-gallon and 16-gallon. Although they are all fantastic, I’m going to be focusing on the 16-gallon version today. I’m a pretty big fan of these types of kits because for the most part, they come with a lot of the things that you need to get started. This particular kits comes with the following: acrylic aquarium, 12V LED light, ceramic media, filter cartridge, air stone, 12V transformer, low-voltage air pump, water conditioner, fish food and some instructions on how to set it up. 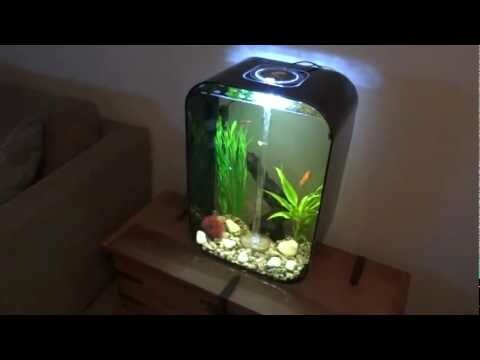 Keep reading for my Biorb Life 60 Fish Tank Review. The aquarium itself measures 16.5 inches wide, 25 inches high and 11 inches deep. It’s not your average small betta fish tank, so you will have to be a bit more strategic in where you put in. However, I like the bigger size because it lets you put more betta fish (or other tank mates) in the same tank, or if you prefer not to do that, your betta will have more room to him/herself. First on my list of pros is the overall look and design of the aquarium. That’s what I love about most of the BiOrb aquariums, they are unique and fit well with modern decor in your home. The underground filtration system is a nice touch because it leaves the tank looking uncluttered and although some people have commented that the filtration system isn’t strong enough, it is perfect for bettas. Lastly, the tank is extremely easy to set up and it won’t take you too long to get things going. Now for the not so great features and first on my list is the air pump. It is loud, at least too loud for me. At first I thought I was the only one, however I can see that other people are commenting about the same thing on places like Amazon and other forums. Is it a big deal? Only if you want to sleep at night! So if that’s something that is important to you, you might want to purchase a different one to go with the tank. (Suggest you try the one in the box first and if you don’t like it, then buy a different one). They aren’t that expensive and definitely not a show stopper from getting this tank. Another thing you should be aware of is that because the tank uses an underground filtration system, it means that the tank isn’t as easy to clean. You will have to move a few things around in order to get to the filter. The only other issue I have with this tank is that in my opinion, the lighting could be a bit stronger. If you plan on growing plants in the aquarium, you may have to tweak the lighting system. If needed, you can buy other LED lights and attach them to the ceiling of the aquarium. I hope you found my Biorb Life 60 Review useful. If you have any experience with this tank, I’d love to hear about it. Just use the comment box below. Best Places To Find Betta Fish For Sale?